Each Molten Core Raid Deck includes 110 Raid Deck cards, a treasure pack containing 10 exclusive cards, and 10 Ragnaros Oversized Hero cards. Featuring the powerful Fire Lord Ragnaros himself -- as seen in the World of Warcraft MMORPG -- the new Molten Core Raid Deck allows TCG players to simulate a World of Warcraft online raid. 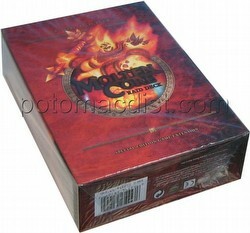 Using the pre-constructed 52-card decks featured in each Raid Deck, players can take on the role of Ragnaros and battle up to five players (who will be using Hero decks built with UDE and Blizzard Entertainment�s Heroes of Azeroth and Through the Dark Portal World of Warcraft TCG sets) to engage in an exciting fight to the end. Each Raid Deck features a sealed Treasure Pack with 10 unique TCG cards (exclusive to Molten Core) that represent Ragnaros�s treasure for those who defeat him. In addition to the 52-card game deck and Treasure Pack, each Raid Deck will also include a Ragnaros deck, a Minion deck, Rune cards, 10 oversized Monster cards and one rulebook.